While watching shows online, I’ve been seeing a lot of this Downy commercial for their “April Fresh” laundry detergent or fabric softener or something. Basically, they put a bed on the street so people can smell the sheets, which have been washed 7 days previously. No one believes them that it’s been 7 days because the sheets smell so perfumed … soaked in chemicals … “fresh” that most people assume they have just been laundered. Every time I see that commercial, I can’t help but wonder what inhaling those chemicals (chemicals which are strong enough to be smelled seven days later) every night for 8 or more hours (that’s 56 hours per week!) could do to your brain…or to your baby’s developing brain. Before we had Nora, I was pretty committed to living lightly on the earth, and that included using sustainable and safe cleaning products. We usually bought Seventh Generation products (although I’ll admit the occasional container of Comet could be found under my kitchen sink) and for a long time we’ve been making our own cleaning products. Once I got pregnant, we renewed our commitment to having the safest environment possible, which meant going 100% chemical free, and, once I experienced the simplicity of cloth diapering, we also made the shift to more sustainable cleaning tools. Not only are these changes healthier for us and for the planet, but they also have the added benefit of being cheaper than traditional cleaning supplies, and on our budget, every penny counts. 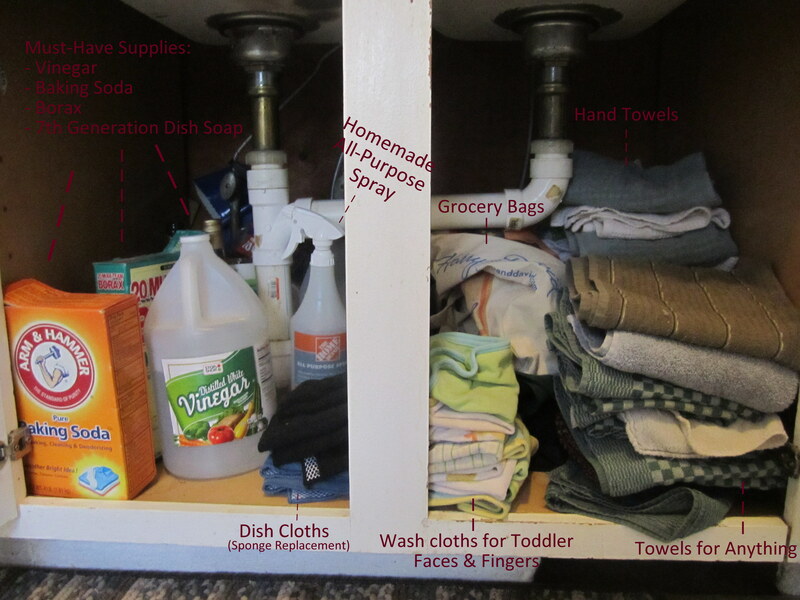 Last night as I was putting away clean (but scentless) towels under the kitchen sink, I thought some of you might appreciate hearing how we clean — and save money doing it. This is cleaning central, under the kitchen sink. Nearly all of our cleaning is done with a combination of water, white vinegar, baking soda, borax, and Seventh Generation dish soap. Sometimes I use lemon juice and olive oil (in the rare instance that I dust), and we use Charlie’s Soap laundry detergent. We make our own cleaning spray and other cleaners with recipes from a great book, Clean House, Clean Planet. The book talks about the hazards of conventional cleaners and provides recipes for the natural alternative. Karen Logan, the author, provides an effectiveness comparison and also a cost savings for each recipe in the book. I highly recommend it. Also under the sink is our vast collection of towels; each with a different purpose. We have the standard dish and hand towels, but we also have a large stack of baby washcloths handy for wiping little faces and fingers, in addition to a stack of “anything” towels and dish cloths. The dish cloths are what I use to wash dishes instead of a sponge, which just creeps me out. I don’t want to imagine the things that might grow on a sponge; in contrast, our dish cloths are used for one day (or part of one day) before they are laundered. The “anything” towels are just that; they clean counter tops, floors, windows, and walls — pretty much anything you might clean or wipe up with a paper towel. They also double as bibs when all the bibs are dirty. The dish cloths were bought specifically for this purpose, but have much longer lives than do sponges and they were inexpensive. The towels are all of our left-overs, towels that don’t “match” our house and such. 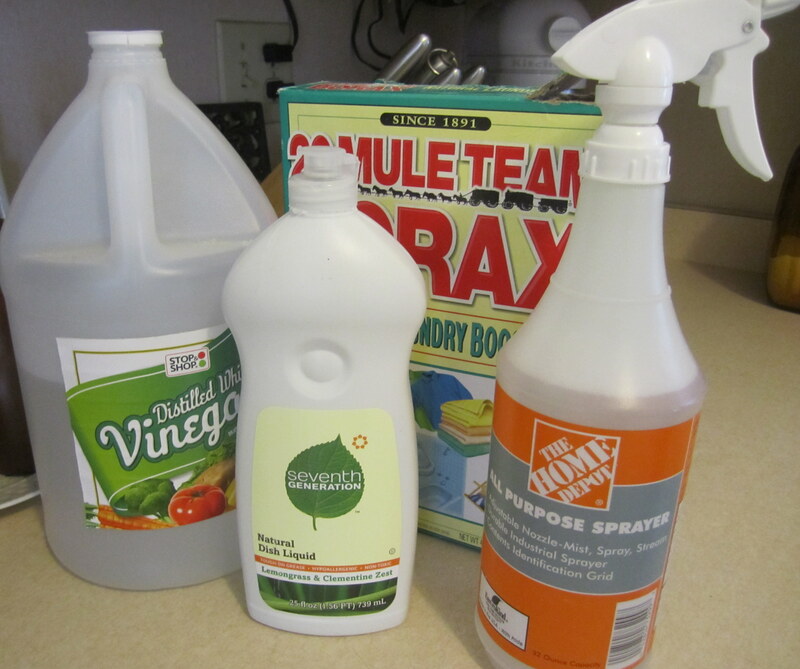 To make: Mix vinegar and borax in spray bottle. Fill the bottle most of the way with hot water and shake vigorously until borax is dissolved. Add liquid dish soap and gently stir or shake to combine. To use: Spray and wipe! *Although not a disinfectant, borax is reputed to have antifungal and antiseptic qualities, useful in an all-purpose cleaner. Borax is mildly toxic to ingest, so if this is a concern it may be omitted from the recipe. I’ve made the spray without borax and had equally good cleaning results. To make: Add olive oil and vinegar to bottle and shake to combine. If a lemon scent is desired, add in lemon oil or lemon juice. Note: adding fresh lemon juice will require the cleaner to be refrigerated. To use: Shake well before each use. Squirt the polish on a terry cloth rag or directly on furniture. Wipe in direction of wood grain. If furniture is especially dirty or has water marks, more vinegar can be added to help clean. To make: Put dish soap and water in a blender and blend until foamy. To use: Spots are best treated immediately, as they happen. Smear the mixture on carpet spots and let sit for a few minutes. Use a carpet or simmilar brush to scrub the spot vigorously. Wipe up excess soap with a towel. To Use: First, clean out drain of hair/food/debris as best as possible. Pour about 1/2 cup baking soda into the drain. Add a cup or more of white distilled vinegar; the mixture will start to fizz. Quickly cover the drain with a stopper (if you don’t have a stopper, any plastic lid will do) and press down firmly until the mixture stops fizzing. (The stopper will insure that the baking soda-vinegar mixture fizzes toward the clog and not up into the sink.) When fizzing stops, repeat with another 1/2 cup of vinegar and stopper to ensure baking soda is dissolved. Flush with boiling water. A lot of people are afraid of vinegar because it has a strong smell. Used appropriately, it is a great cleaner. I use it mixed with water to mop the floors, wash the windows, and even in place of fabric softener (sometimes…usually I don’t use any “fabric softener” because Charlie’s Soap is so great, but every no and then I’ll throw a little bit of vinegar in to give everything a good final rinse). The acid in vinegar dissolves soap and detergent to really leave a surface (or clothing) clean. Baking soda is good for more than baking. I use baking soda to scrub my tub. It’s abrasive enough to get it clean (especially when combined with a brush), but natural enough not to irritate Nora’s super sensitive skin. Baking soda is also a great deodorizer because it absorbs smells. Sprinkle it in the bottom of trash cans and diaper pails to help with odor. Baking soda is also good at absorbing spills — back when we had lots of carpet, if something especially worrisome was spilled (gulp, wine) I would quickly douse it with baking soda before getting the Foam Alone ready; the baking soda would pull the liquid up instead of letting it settle down into the carpet and pad and could be vaccummed up. Yay vinegar and baking soda! And the kids love spraying everything. What do you use for laundry? I’ve just started using Chris’s DriftAwaySoap laundry powder. It’s saving me a fortune as you only need 1-2 tablespoons. We have a well so have to be extra careful of what goes down our drains. We use Charlie’s Soap. It’s the same deal – only requires 1 tablespoon, which saves a ton of money! It’s a natural additive free detergent; it’s even cloth diaper approved. Their website is http://charliesoap.com. What do you use when you want to disinfect surfaces, like in the bathroom? I use my all-purpose spray for all bathroom surfaces (since it has a small amount of Borax in it I figure that’s disinfectant enough). I put straight Borax in the toilet bowl, about 1/2 cup, and scrub with a toilet brush. Hot water (boiling) is something I do too, if I’m worried about germs in or on clothes/cloth diapers/baby things. If you really want something, tea tree oil is a great natural disinfectant, but I haven’t felt the need to go out and buy it. To be honest, I am not a big germaphobe, so I don’t worry too much about disinfecting things. Both Chris and I are concerned about contributing to the increase in antibiotic resistant bacteria and super viruses. For this reason, we never purchase antibacterial soap, hand sanitizer, or cleaning products (that’s also a large reason why we buy organic dairy). For what it’s worth, we have a very healthy household. Nora was not sick even once in her first year — despite being exposed for multiple days to strep throat at her babysitter’s. She’s had a few runny noses since then from being around other kids, but has never had a fever/flu/bronchial infection, etc. Aside from a minor (2 days max) stuffed up nose, I can’t remember the last time I was sick. Thanks, I am a very casual housekeeper. But I have messy teenage boys, so it is hard to resist the feeling that the bathroom needs to be degermed once in a while. I love borax and it is cheap so I will stick with that and vinegar. we use shaklee products now, and it’s great. we’ve been cleaning our kitchen with it and I can walk on it immediately without being concerned about foot cancer : ) you can also use it on your fruits/veggies to remove that wax they put on them.